A new easy-to-use device can quickly and accurately screen for a variety of diseases, including Zika, Ebola, hepatitis, dengue, and malaria. 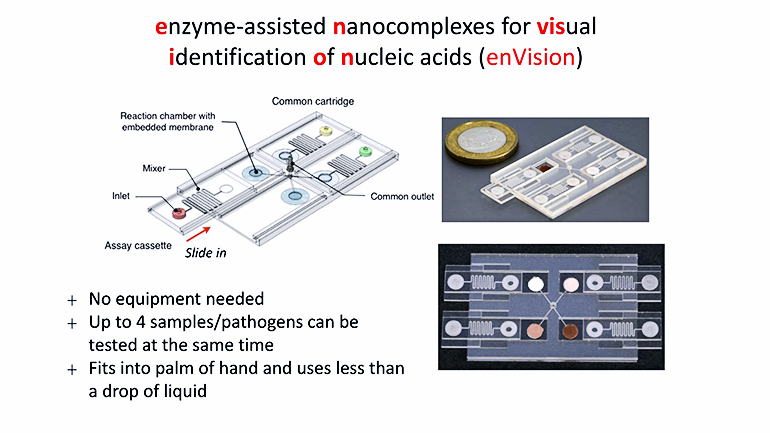 The portable device, called enVision (enzyme-assisted nanocomplexes for visual identification of nucleic acids), can also screen for various types of cancers and genetic diseases. EnVision takes between 30 minutes to one hour to detect the presence of diseases, which is two to four times faster than existing infection diagnostics methods. The device also costs less than 75¢—100 times less than tests currently in use. “The enVision platform is extremely sensitive, accurate, fast, and low-cost. It works at room temperature and does not require heaters or special pumps, making it very portable,” says team leader Shao Huilin, assistant professor from the Biomedical Institute for Global Health Research and Technology (BIGHEART) and biomedical engineering department at National University of Singapore. “With this invention, tests can be done at the point-of-care, for instance in community clinics or hospital wards, so that disease monitoring or treatment can be administered in a timely manner to achieve better health outcomes,” says Shao, who is also an investigator with the Institute of Molecular and Cell Biology (IMCB) under the Agency for Science, Technology and Research (A*STAR). As reported in Nature Communications, researchers used the human papillomavirus (HPV), the key cause of cervical cancer, as a model to validate the device’s performance. When compared to the clinical gold standard, the new device demonstrated superior sensitivity and specificity. “EnVision is not only able to accurately detect different subtypes of the same disease, it is also able to spot differences within a specific subtype of a given disease to identify previously undetectable infections,” Shao says. Further, test results are easily visible—the assay turns from colorless to brown if a disease is present. Researchers could also further analyze the results using a smartphone for quantitative assessment of the amount of pathogen present. That makes the device an ideal solution for personal health care and telemedicine. “Conventional technologies—such as tests that rely on polymerase chain reaction to amplify and detect specific DNA molecules—require bulky and expensive equipment, as well as trained personnel to operate these machines,” says co-first author Nicholas Ho, a researcher from NUS BIGHEART and A*STAR’s IMCB. “With enVision, we are essentially bringing the clinical laboratory to the patient. Minimal training is needed to administer the test and interpret the results, so more patients can have access to effective, lab-quality diagnostics that will substantially improve the quality of care and treatment,” Ho says. EnVision adopts a “plug-and-play” modular design and uses microfluidic technology to reduce the amount of samples and biochemical reagents required, as well as to optimize the technology’s sensitivity for visual readouts. “The enVision platform has three key steps—target recognition, target-independent signal enhancement, and visual detection. It employs a unique set of molecular switches, composed of enzyme-DNA nanostructures, to accurately detect, as well as convert and amplify molecular information into visible signals for disease diagnosis,” explains co-first author Lim Geok Soon, a researcher from NUS BIGHEART and A*STAR’s IMCB. Each test is housed in a tiny plastic chip that is preloaded with a DNA molecular machine that is designed to recognize disease-specific molecules. Researchers then place the chip in a common signal cartridge that contains another DNA molecular machine responsible for producing visual signals when it detects disease-specific molecules. Researchers can mount multiple units of the same test chip—to test different patient samples for the same disease—or a collection of test chips to detect different diseases onto the common cartridge. “Having a target-independent signal enhancement step frees up the design possibilities for the recognition element. This allows enVision to be programmed as a biochemical computer with varying signals for different combinations of target pathogens,” Ho says. “This can be very useful to monitor populations for multiple diseases like dengue and malaria simultaneously, or testing for highly mutable pathogens like the flu with high sensitivity and specificity,” Ho says. It took about a year and a half to develop the enVision platform. Building on the current work, researchers are now developing a sample preparation module—for extraction and treatment of DNA material—which they plan to integrate with the enVision platform to enhance point-of-care application. In addition, the research team foresees that the smartphone app could include more advanced image correction and analysis algorithms to further improve its performance for real-world application.